It’s almost unimaginable, but the San Carlos synthetic turf battle is heating up once again. The last battle lasted through three city councils, four Parks and Recreation Commissions and ten very long years. At long last, synthetic was installed at Highlands Park. Now, the City of San Carlos and residents surrounding Crestview Park appear ready for yet another showdown as the City moves toward plans for synthetic turf for that field as well. For those of us who were involved in the process the first time, nothing that I write in this post could accurately describe the frustration felt by both sides of the issue. If you were not totally dialed in to San Carlos politics from 2001-2010, the tension and frustration surrounding the planned installation of synthetic turf in San Carlos would match that of the outcry over the recent police and fire cuts, the transit village and school bond measures, combined. Those that have been around San Carlos for a much longer time will tell you that nothing tore the community apart as much as the debate over synthetic turf. Name calling, lawsuits, folks carrying signs like “We are raising kids in San Carlos, not grass,” and “If you want grass, move to Modesto,” all were unfortunate by-products of the synthetic turf era in San Carlos. Things were a little tense. During the first half of those ten years I spent time on Parks and Recreation Commission. During the second half I was the President of San Carlos United, better known in the community as CYSA soccer. Both of those positions gave me a front row seat to a heated battle which had some unfortunate turns. I have written this post, not to be an advocate for either side, but rather to try and give everyone the history on the matter as well as an objective view from both sides of the issue. Before looking at the current situation at Crestview, it is probably a good idea to take a look at how we got here. Believe it or not, this all started in 1982. At the time, San Carlos was not anything like it is today. It was more of a sleepy town. In fact, there were so few kids in San Carlos, one of the elementary schools actually closed down, that being Laureola School. San Carlos High School was also closed and wiped away. At the time, the city had enough fields to comfortably hold all sporting activities for all who wanted to participate. The fields at San Carlos High School also got a lot of play from AYSO and Little League. While Highlands Park and Stadium fields are still there, San Carlos High School had an upper field and an additional lower one that were lost when the housing tract went in. By the end of 1986, San Carlos was down a net, two fields. At about the same time, the La Mesa soccer field was shut down and sold off for a housing tract as well. This regulation field was just off La Mesa Drive and had beautiful views of the entire Bay Area. As far as soccer went, it would be difficult to find a better venue. By 1986, San Carlos had lost a net, three, full size fields. What the city did not know at the time was that San Carlos was getting ready for a major change in its identity. Kids were on their way. Silicon Valley was growing and the mid-peninsula became a hotbed of activity. The first real influx of kids and families came in the mid 1990s. By the late 1990s White Oaks School began to make a name for itself and all other San Carlos schools followed suit, attracting families with kids in far greater numbers than in previous years. By 2000, San Carlos was on the map for many buyers looking for a small town with great schools and hometown charm. Since that time, San Carlos has transformed itself into a family-friendly destination. It has become a primary target of many buyers, who, in previous years, would not have given it a second thought. By the end of the 1990s, the city realized it had a substantial problem. The Parks and Recreation Department could no longer guarantee the field requests put in by the various sports organizations in San Carlos. In an effort to help sort out their options the city spent a hefty some of money on what has become known as the Mahady Report. In 2000, the Mahady Report was published. This report was conducted by an independent consulting firm which looked at the field use in San Carlos and tried to come up with some options to help the city deal with their field shortage issue. The report came to the alarming conclusion that the fields which were currently in play could not sustain themselves under the current level of activity. The fields were failing almost immediately after a particular season’s sport was started. The report made two key suggestions: (1) have mandatory, extended closures for all fields during the year so that the fields could recover and hold off on failing so quickly; and (2) the option to add a synthetic field which could handle unlimited play without the field failing, thus alleviating the pressure on the other fields. Thus, the idea of a synthetic field was born in San Carlos. In the early 2000s, the Parks and Recreation Department was led by Barry Weiss. Weiss and the rest of the department recommended turning one San Carlos field entirely synthetic. In order to get the biggest bang for their buck, three main sites were considered: (1) Highlands Park; (2) Tierra Linda; and (3) Heather School. Highlands was instantly the most attractive because it was already fitted with lights and play could extend until 10:00 pm at night. In order to match the same return, Heather and Tierra Linda would have needed lights installed as well, which made them less appealing. However, the neighborhood impact of more play on the field was projected as far less substantial at Heather and Tierra Linda. So, the result was a balancing act by the city through countless neighborhood meetings, commission meetings, special committee meetings and city council meetings so large that the venue was changed from the normal City Hall chamber to the Youth Center at Burton Park. The issue was finally dismissed by City Council, then re-opened and later put into motion at Highlands Park. 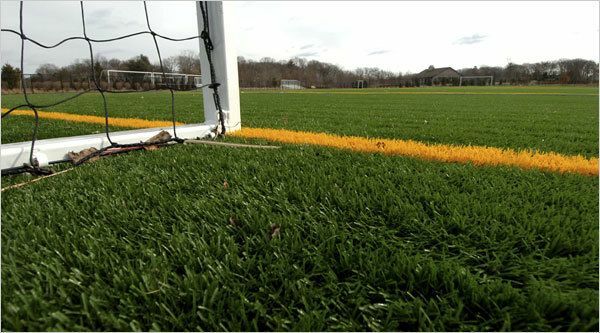 In Favor of Synthetic Turf: Increasing the playable hours on fields is an overall benefit to the entire community and would relieve the stress on other natural fields. Since most fields in San Carlos automatically go to a closed status if a rain cloud is even in in the vicinity, a synthetic field would be more appealing as it would allow for play regardless of weather conditions. In theory, the field could take play 24 hours a day and not require any down time. The synthetic field requires hardly any maintenance. On the environmental side, it saves the need for water and the chemicals that are used to keep up most fields intended for sports use. Finally, proponents made the case that the synthetic field would reduce injuries. Because of a slight “give” in the field surface and perfectly flat and predictable pitch, injuries would be reduced. Against Synthetic Turf: Adding a synthetic surface to an otherwise natural park did not make much sense. Instead of compromising our limited natural playing surfaces, opponents of turf encouraged the city to look for other field space and answer the city’s need for space that way instead of compromising existing fields. Concerns over just how the synthetic field would wear after a few years was a concern as well. Each venue also had individualized objections. For instance, the Highlands neighbors argued that a synthetic field would create an athletic complex, which was not the true intent of Highlands Park, which they viewed more as a neighborhood park. Neighbors surrounding the school sites had similar concerns but also raised concerns about possible environmental issues with having a synthetic field on a school campus. Opponents also argued that the city’s method of payment for the field was against the intent of its Measure G funds. Measure G was a tax measure in San Carlos which raised money to help maintain the city’s parks. (1) Lights. At the end of the day, in my opinion, this is what ultimately sold the city council on the Highlands Park location. Highlands, since its inception, was planned with lights. Lights simply allowed for more playable hours and gave the city the biggest bang for its buck. (2) Field Condition. Don’t get me wrong, Crestview field needs some work. However, the Highlands Park field would literally fail two weeks into the soccer season. This was largely due to the fact that it was originally built with a sand base, which did not adequately hold the grass. (3) Parking. Highlands Park could easily hold 100 cars, while Crestview might hold 20. However this ends up shaking out, hopefully it will be a much more efficient process and much less polarizing than the first time around. Bob, thank you for writing about this. Unfortunately, if the City persists with its proposal to convert neighborhood parks to synthetic turf, I don’t see any alternative to the process getting more polarized. As a parent who had kids play in AYSO for many years, I’m fully sympathetic to the needs of the soccer community to increase play time. However, essentially taking over parks utilized by a much broader segment of the community is the wrong way to go about it. Those that support expanding soccer in San Carlos would be much better off long term persuing solutions that can gain the support of neighborhoods instead of making them hostile to sharing fields neighborhood parks as we now do. Although I don’t support pursuing the battle into court as was done over synthetic turf at Highlands Park, I do believe in holding the City Council’s feet to the fire at the ballot box. Given the people I’ve talked to, converting natural grass fields to synthetic turf is supported only by a small minority of residents in San Carlos. Even many soccer families have mixed feelings and will often oppose the idea of synthetic turf at fields such as Crestview Park. To validate this view, my fellow neighbors of Crestview Park and I will be making our case to the larger San Carlos public this coming weekend at Hometown Days. There we’ll talk with hundreds of residents outside our neighborhood and get a better sense for how the broader San Carlos population feels about synthetic turf vs. natural grass in parks. If our suspicions are correct, we’ll find a lot of support in the community for opposing sythetic turf and this support will ultimately bring grief to City Council members that vote to convert Crestview Park to synthetic turf. We are new to the area (thank you Bob for representing us with our home purchase in San Carlos). As Bob points out (indicated by the number of parking spots) Crestview Park is extremely small compared to Highlands. It’s a quaint little park with a small grass footprint. I have two boys who both much prefer to play on natural grass (my 10 year old plays little league at Laureola and my 7 year old plays on turf at highlands & AYSO). This is my first year in San Carlos but from speaking with lots of parents (including those who live in other parts of San Carlos, as well as work colleagues (6 of them from my company who live in different parts of San Carlos, all with kids), I haven’t come across any who prefer turf over grass. I never attended a community meeting before but have been to a couple Parks & Rec to familiarize myself more and learn about this issue and the communities needs. It has been obvious that the commission wants to represent all of San Carlos (which is their duty) but the hundreds of folks I’ve witnessed attending are 90%+ in favor of grass over turf, yet the commission seems to be ignoring this and setting up the majority for disappointment. Hometown days is a great opportunity to continue to gather input from the entire San Carlos community. If we can take the opinion and emotion out of this, and make quantitative (i.e. how many names does it take to render a decision the city council will declare represents the majority of anyone who resides in San Carlos that cares about this initiative?). Does that council want to see a 90/10 split? Do they want to see 1000 signatures? Would be great to understand what success looks like to make this less emotional and more rational, for both sides of the debate. Helpful, in depth perspective. I worked on the Highlands initiative but didn’t know this much background. Am also a parent of 2 former AYSO kids. Can see both sides to it, but as this is the one park in the upper half of San Carlos that’s meant to serve a large, diverse cross-section of people, the design needs to focus on the community, Spending more money in favor of one sport at the cost of the other sports and activities doesn’t seem equitable. Agree with your comment on the lights and parking. It also doesn’t feel right that San Carlos would spend city budget funds to cover a natural park in plastic grass at the same time they’re requiring grocery stores to eliminate all plastic bags and convert to paper. Hopefully we can find a solution that keeps everyone happy. The numbers don’t add up especially for a city that is struggling financially. When are we going to be responsible to the numbers that run this city? I was wondering what people’s experiences are of using the synthetic turf at Highlands Park. Do kids like using it for soccer, baseball, and so forth? What about just walking on it for fun? Does it feel like grass? I run a flag football league for San Carlos. The field at Highland does its job amazingly well. It provides an all weather playing field where kids can play on regardless of weather. Does it feel like grass? Yes, sort of. However it does get warmer than natural grass. However, unlike most artificial turf fields, this one has a coconut underlayment for a more organic feel. No small rubber pellets. We played lots of games at night last season with no injuries and no rainouts! The issue at hand is that San Carlos has too little parks and fields for our kids to play. We have 1/2 the number of parks that Foster City has with the same population. When rainouts happen, it wipes out playing time for hundreds of kids. Crestview will help open up other parks and playing time for other sports.